The nonlinearity of the points in Output 4.30.1 indicates a departure from normality. Because the point pattern is curved with slope increasing from left to right, a theoretical distribution that is skewed to the right, such as a lognormal distribution, should provide a better fit than the normal distribution. The mild curvature suggests that you should examine the data with a series of lognormal Q-Q plots for small values of the shape parameter , as illustrated in Example 4.31. 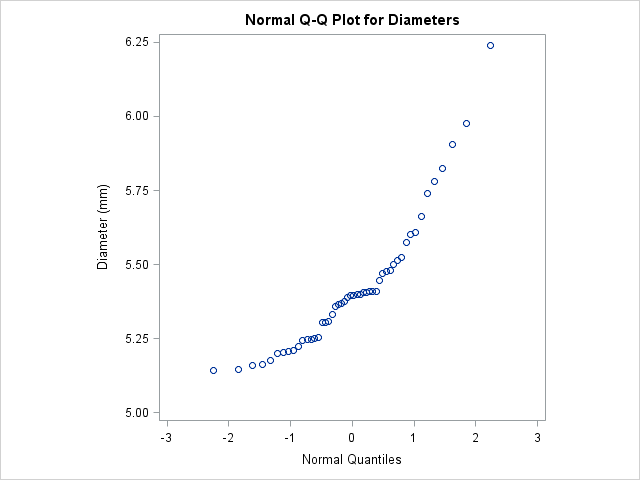 For details on interpreting a Q-Q plot, see the section Interpretation of Quantile-Quantile and Probability Plots.